A few days ago, Sam Stoddard posted on Twitter that R&D’s goal was to make dragons competitive in Standard. Mission accomplished, guys. The breakout deck of the event had to be UB Control, insomuch as a well-known archetype can break out. After no real presence at any major events since the release of Dragons, this was the coming home party many were looking forward to. It wasn’t just reasonable, either—PV commented that it’s the best deck he has played at a Pro Tour in quite some time. As many suspected, Dragonlord Silumgar is in fact the real deal. Without a removal spell handy, Silumgar puts games away in a hurry. Adrian didn’t run Silumgar, though he seems to be in the minority. Both the other two control decks in the top eight ran him, and he was peppered throughout the other top-scoring Standard decks. Consequently, some time over the weekend, he was bought out to nothing but a scant few foil copies available. His price isn’t soaring out of control though; I see a few copies available for $10 to $12 as of writing this on Monday evening. Even though Silumgar is an excellent creature in these decks, he simply isn’t needed as a four-of. While Ojutai and Atarka are arguably playable playsets, Silumgar is often found solo or as a pair. I anticipate we see his price hover between $8 and $13 for the time being, and quite possibly dipping below that. Dragonlord Atarka, on the other hand, is the real winner of the weekend. There were seven copies across two decks in the top eight, and no shortage in the other top-performing lists either. It turns out that the mana engine represented by Nykthos, Sylvan Caryatid, and Courser of Kruphix is enough to get people to play four seven-drops in their decks. This won’t be the last we see of this going forward, and while the number will vary between one and four, I wouldn’t be surprised if most decks wanted nearly the full set. There’s simply no better creature to flip off your See the Unwritten with Surrak, Caller of the Hunt in play. Green Devotion is going to be a contender right up until October when Theros rotates, and even once it does, people won’t forget how strong Atarka is. Her current price tag of nearly $20 is still on its honeymoon, but I doubt we see prices below $10 in the near future. I’m a seller today, though once we’re at $10 I’m happy to start picking up copies in trade. The omnipresent casual demand for huge awesome dragons quietly exerts quite a force on cards like this. The known dragonlord coming into this weekend, Dragonlord Ojutai, did alright, if not quite as well as Atarka and Silumgar. We saw two copies on Sunday and five decks in the top sixteen played him, as well—four of them control and the fifth Wescoe’s Bant list. All said, that’s six high-profile decks he appeared in, though five were the same archetype. What’s that mean for his current price tag of nearly $20? I’m selling into post-tour exuberance. A $20 price tag usually indicates a card is the best or second-best card in the set, and I’m not convinced yet that it’s Ojutai. I seem to be in the minority on this, though, so if you want to hold, I guess I can’t fault you. I’m concerned that as a blue and white dragon, he lacks a lot of the casual support that the others enjoy, which means he has to work a lot harder in Standard to sustain the same numbers. A blue dragon we can afford to be more interested in is Icefall Regent, up to $5 on the back of this weekend’s admittedly minor showing. I didn’t see much of it on camera, though I didn’t watch all of the coverage. There were five main deck copies between two of the control lists, and people apparently latched on to that. I liked it in my set review, and I still like it now. It’s great at stopping Siege Rhinos or Surraks from beating you up, and following up a Thunderbreak with Icefall is going to be absolutely miserable to break up from the other side of the board. At $5, I feel like we’re at 75 percent of the card’s price potential, so I’m holding off, but if we see this dwindle back below $3 it’s worth getting in. Thunderbreak Regent did reasonably well, and the $10 price tag is sticking. We’ll see variations in this number in the coming weeks, though don’t expect it to stray far south of that. Don’t feel bad trading into a set at this point if you need them. One last dragon worth noting is the big kahuna himself, Ugin. Five of the top eight lists had at least one copy, and six of the sixteen top-performing Standard decks ran at least one as well. That means that 38 percent of the best Standard decks in the room had Ugin in them. Taking a quick peek at Modern statistics, the only cards played in more decks than Ugin is are Lightning Bolt, Island, and Spellskite. Standard has five or six cards that show up in more decks than Ugin, but still. His presence is impressive. Add to this that he’s desirable in nearly every single other format—Modern, Legacy, Cube, EDH, and casual—and you have the makings of possibly one of the most expensive cards in Standard since Jace, the Mind Sculptor. Ugin is comfortably over $30 right now, and I think it’s more likely than not that he reaches $40 while still Standard legal, with prices north of that entirely possible. I’m willing to trade for him aggressively, and if you can get foils in trade for under $100, take those deals. When was the last time we saw an iconic mythic character that pinged every single player demographic in every single format? Halfway down the mana curve is Surrak, the Hunt Caller, who is certainly worth watching after this weekend. While not every deck capable of generating GG was running him, plenty were. It seems as if he’s going to be a frequent member of the green party in the coming weeks. With copies available below $3, I’m happy to trade for him all day. At the very least, you aren’t likely to lose any value in that transaction, and over the next few weeks we may see him quietly creep up to $5 to $6 or more. As for cards that play especially well with Surrak, I’m a big fan of See the Unwritten. We already saw a taste of it in the top eight at the Pro Tour, with Ondrej flipping Atarkas into play off of it. Surrak turns on the ferocious trigger, and putting just about anything into play will turn on his hasty formidable trigger. It’s a match made in heaven. With dragons running rampant and Eldrazi on the horizon, I feel like you can’t miss buying into this at $2 to $3 a copy. When the first Eldrazi gets spoiled this September, this is going to hit double digits. I’m in for sixty or seventy copies right now, and I’m looking to pick up more during the summer lull. Sticking to cards red in cost and spirit, I don’t see much beyond Zurgo Bellstriker worth discussing. As is often the case, the format’s burn decks are often comprised heavily of commons and uncommons. It seems as if Zurgo was a two- or three-of most of the time, which doesn’t surprise me. While UB control may not mind getting stranded with an extra copy of Silumgar, or Abzan midrange with an extra Elspeth, a small red decks is really going to feel it when one of its cards is legend-locked in its hand. His price is currently around $3, which feels about right. There’s upside here in the $5 to $6 region if it turns out that cubes and casual players alike take to dash, but without that additional demand, he should stay at $3 and below. The top eight composition tells a story. While that story is one many will read, it’s not the whole story. Only one player in the top eight had a top-performing Standard deck; the rest got there in no small part due to their draft records. If these eight decks weren’t the best Standard decks of the field, then what was? Six of the top sixteen were various flavors of Abzan. The breakdown leans in midrange’s favor, though both aggressive and controlling builds were represented. Siege Rhino, Anafenza, and Tasigur were the cornerstone threats of these decks, with Dromoka’s Command making a healthy showing as well. Both Siege Rhino and Tasigur being as cheap as they are is an anomaly and every single time I sit down to open another’s binder these days, I’m scanning for them. Getting them at $5 and $6 in trade is going to pay off this fall unless Wizards decides to totally hose me by putting them at uncommon in Origins or something. I also don’t really understand Anafenza at $4 or $5 right now. She’s a premier threat in Abzan Aggro, which I guess we’ve decided is a real deck. I’m happy to trade for her as well right now. I don’t think you stand to lose much here, and there’s a definite upside near $10 as a mythic. Dromoka’s Command is showing up in lists all over the place, from Abzan Aggro to Bant Heroic. Tom Ross wrote a well-deserved love letter to the card last week describing that it seems to do far more than it reasonably should. With copies pushing $10, I can’t advocate acquiring any at all, though if you need them to play with, you shouldn’t feel bad about it. The ship has basically sailed here: sell ‘em if you got ‘em, and stay away otherwise. The rest of the top sixteen was a mix of UB control, various similar types of green devotion, and a clever Collected Company brew out of Bram Snapvendragoners that looked to flip Avatar of the Resolute and Reverent Hunter into play. It seems like everyone and their brother wants Collected Company to be good right now. I’ve seen it floated as an engine in more Modern decks than Heartless Summoning already, and even in wacky UG Standard decks with Shorecrasher Elemental and Silumgar Sorcerer. That $4 price tag is going to hang strong for a while as people try their damndest to get it to work in every format imaginable. There’s a possible jump to $8 on the horizon if it really does get cracked, though that level of success seems remote at this juncture. Den Protector had a solid showing on camera this weekend, which drove it upwards of $5. It plays well as a method for combo decks to Gravedigger lost components, midrange decks to buy back Downfalls, and aggressive lists to keep up the threat density while presenting a semi-evasive clock. Overall, it’s a very reasonable creature, though I think we’ve found its price ceiling. The effect is useful, but morphing is a high cost, and it’s not splashy or exciting as “just” a two-for-one. I’m selling my spares. On lands: fetches should stay steady and rise down the road. I take them in trade anywhere I can get them. It looks like the pain lands started dropping off recently, which is to be expected. Get rid of them soon. Urborg, Tomb of Yawgmoth is just going to keep rising. Trade for it. Haven of the Spirit Dragon’s price remains intransigent at $4. That’s a nut I expect to crack this summer. One of the juiciest parts of Pro Tours always comes in the two weeks after, when pros begin discussing the decks they landed on, but more importantly, what they didn’t land on. Some of my favorites to watch include Sam Black and Zvi Moshowitz. While the Pro Tour does an excellent job of fleshing out a metagame for the rest of us, it’s easy to forget that it’s only a single event on a single weekend. Decks that were not viable at the Pro Tour may be excellent two or three weeks later. For instance, with the success of control this past weekend, expect to see a lot of Foundry Street Denizens in the near future. As red decks beat up on control, midrange strategies such as GW Devotion lists will rise in strength, and then combo decks like Jeskai Ascendancy will be able to beat up on a midrange-heavy format. Lee Shi Tian and MTG Mint Card were on the deck this weekend, and while he tweeted that the format took the wrong turn for them, it doesn’t mean we won’t get there eventually. Knowing what decks just missed the meta is good, especially when they’re new brews. Maybe Sam will tell us that his team was on a Sarkhan Unbroken list right up until the night of the Pro Tour, when they realized it just couldn’t beat UB Control. That type of information is excellent—we get confirmation of cards and interactions that are definitely strong enough for Standard but that just didn’t have the weekend they needed. Insights into decks that weren’t chosen and why they weren’t chosen gives us a crystal ball through which to see into the future. We can’t be sure that our supposed Sarkhan Unbroken deck will assuredly take over Standard at one point, but we can at least know that it’s capable of it. Watch for “almost played” lists for insight into what may take over the next Standard GP. What would be your pick for the top 3 highest priced mythics from DTK in 4-6 months now that we have Pro-Tour results. Care to throw out a “conditional” long-term top 3 pick? I know things can change quickly and casual demand is hard to evaluate, but Narset just doesn’t seem like she belongs at the top. Currently Narset is the highest priced card in DTK. 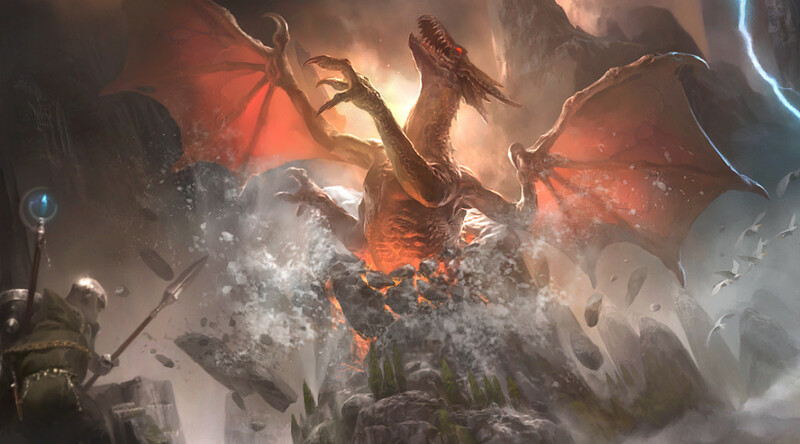 Dragonlord Atarka just got bumped up to #2 and Deathmist Raptor is #3 Dragonlord Ojutai #4 and Sarkhan Unbroken #5. Before Zendikar hits, I’d guess it will be some combination of Ojutai, Silumgar, Atarka, and Deathmist Raptor. Dragon Whisperer and Shaman also have outside chances. At this point, the only reason Narset would be in the top three is because it can take Planeswalkers a long time to dwindle. Pain lands are starting their pre rotation drop. What are your (anyones) thoughts on the price trajectory of Scry lands? I’ve talked to some people about this and the consensus seems that they will drop to the 1-3$ range post rotation. Should I be aggressively moving them? They are basically unplayed in all other formats. Get rid of all spares. Thanks! Listing to eBay now, since Puca isn’t touching them! Other than Temple of Malady and a few months ago Temple of Epiphany I’ve had a brutal time trying to move scry lands. I second Travis’s comment, move ALL your scrys ASAP. At best I’m trying to trade playsets of scrys that someone wants for a new deck (Temple of Abandon for example for RG dragons) for any sort of Fetch or anything I think will be played 9 months from now. Travis, excellent article. I like it much better than last week’s. LOVE your analysis of the top Standard Decklists and not just the top 8 cause as you said Drafting was involved in those records. I’m not surprised that good drafters play UB control decks…also not completely surprised but still shocked by your data that Abzan did so well in the Standard portion. I guess it still isn’t that hard a decision to cast a Siege Rhino, and even less difficult to cast your second or third. I thought RG got strong enough with Thunderbreak and Roast to put up good results vs Abzan but maybe it’s still not good enough. I have a few quick comments for you about why some of the Abzan cards aren’t pricier. Siege Rhino, while amazing and heavily played in modern, is still a 3 color creature and a rare in the most opened product in magic history (until battle for zendikar arrives). I think you are correct in acquiring the Rhino, but do you ever see him jumping $10?? Can Modern interest alone keep the Rhino at a high price tag and does having the fetch lands in the same set as him keep his price down?Anafenza simply isn’t that good a Standard card. Her value comes from Commander and Tiny Leaders and I believe the foils are what players want for a commander (right?). Anafenza on an open board is quite frankly unimpressive (unless you are playing Sidisi Whip and have no removal)…I’ll gladly cast my Ashcloud or Thunderbreak or chump block with my satyr wayfinder or keep making Xenagos satyrs to block and attack with my Courser and dragons. Anafenza is a 3 of in one deck, and she does her best work with either Fleecemane Lion (though to cast Anafenza you tap out and can’t protect the Lion) or with Siege Rhino and the big dumb rhino doesn’t need Anafenza to be good. She’s kinda like Loxodon Smiter, a great value 4/4 for 3 mana that is just OK in today’s world of Standard. The one caveat is I think control has to Downfall her if she resolves, I don’t believe there’s another removal spell other than vault or crux, Icefall is just a temporary roadblock or stall. So with more control maybe more Anafenza? I still think Tasigur is amazing as well. I hastily put together a Jund deck which was RG dragons splashing for Taz and Cut main with Ultimate Price in the board. I didn’t have enough time to fix the mana or playtest but Taz was utterly broken in the deck in the event I played. When you have useless mana dorks or a clogged board and Xenagos out Taz is absurd, he’s just a high level magic player’s card and I think that is holding him back. I keep calling it the “big dumb rhino” but there’s no skill in playing Siege Rhino, you cast him and he changes the game in your favor. SIMPLE!! Tasigur you have to delve right, have mana up, and get a little lucky with your deck and graveyard. And now if the dragons take over control he might drop in price some more if he gets bumped out of the deck lists. I still agree with your past comments that foil Tasigur for the right price is a no-brainer acquisition. One card you didn’t talk about is Atarka’s Command, what are your thoughts on this card? I think it shined a little bit at pro tour and if there’s going to be a burn type deck in standard it’s going to be RG. I’ve also heard that modern (or legacy??) burn splashes green for destructive revelry so then there would also be room for this card?? I’ve picked up some of these already but is there any sort of strong future for Atarka’s Command in your opinion? Thank you Travis, take care. Don’t be confused. UB and Esper Control did not make the top 8/16 purely off good drafting. That archetype had arguably the most successful standard win rate of the weekend.